Avios points are the mileage currency of British Airways. In my opinion, they are some of the most useful points for booking award tickets. Of course, there are pros and cons of using Avios, and this post will try to cover the optimal conditions and to get the most value out of your Avios, and how. There are 3 main ways one earns Avios: either through flying on British Airways, credit card signup bonuses, or point transfers from other reward programs. For us, we’ve only built up our balance in Avios through the latter 2 methods. If you keep you eyes open, periodically there are signup bonuses of 50,000, and even 100,000 Avios for British Airways branded Chase credit cards. They can also be transferred from other point-earning credit card programs, the most common are: American Express Member Rewards or Chase Ultimate Rewards. Those credit cards also commonly have large signup bonuses, and would be an easy way to build up a nice balance. The single, most valuable redemption for Avios miles are for short one-way or round trip flights on any OneWorld (OW) alliance partners. The worst redemption of Avios, ironically, are on British Airways flights originating or terminating in London because of the hefty taxes and fuel surcharges. Our personal strategy for Avios are to use them for short, expensive, mostly one-way hops once you’ve made it to the region you want to travel in. On our trip to Lima earlier this year, round trip flights from Lima to Cuzco normally cost about $300 per person, but with Avios, our flight cost 9,000 Avios + $40 in taxes. We regularly fly to Toronto, and last minute cash tickets can normally cost upwards of $300 but with Avios they’re only 9,000 Avios + $50 in taxes. Later this year we’re planning a trip to Australia, and will be using Avios to route us around Australia. Another great redemption of Avios points are for premium seats on certain long haul routes. 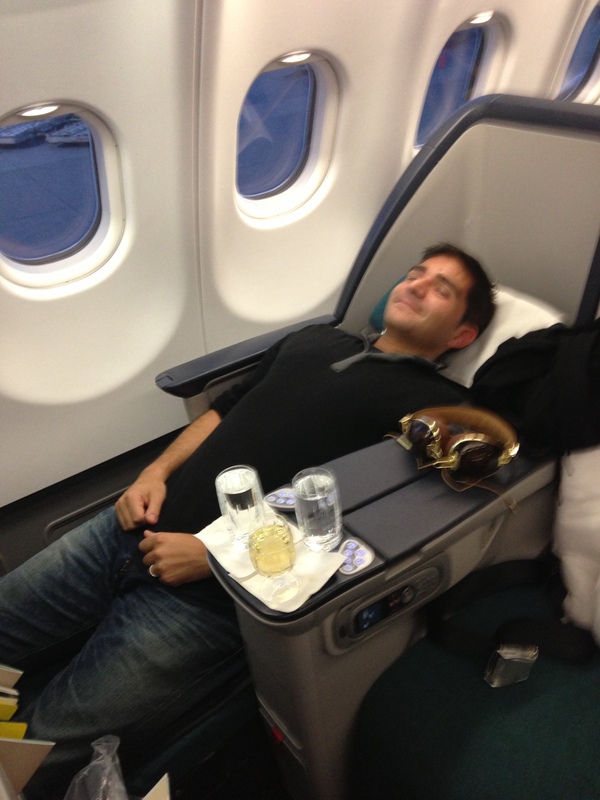 We flew from Boston to Dublin several years ago in business class for 50,000 Avios and $100 round trip. Based on the examples above, a flight from NYC to Toronto (YYZ) is 357 miles, and falls into the first redemption category of 4,500 Avios for an award ticket – which is a great value! The same award flight using American Airlines points, would require 12,500 points. When there are stopovers, Avios tend to not be the best option. For example, if you wanted to go to New Orleans (MSY) from NYC, no OW carriers fly there direct, so a stopover is required in Dallas (DFW). NYC-DFW is 1389 miles, and DFW-MSY is 447 miles. With Avios, that would cost 10,000 for the first leg, and 4,500 for the second for a total of 14,500. In this scenario, you’d be better off using your American Airlines points which would still only cost you 12,500 points for any destination in the continental US. Premium travel, if you have a healthy Avios balance, is something you should consider as well. The earlier mentioned flight from Boston to Dublin (one of the shortest transatlantic flights) is 2,993 miles just sneaking in under the 3,000 mile limit for band 4 – a sweet spot on the award chart, where the next fare band has a more significant increase versus the prior ones. Another great premium redemption is on Cathay Pacific. NYC to Hong Kong (HKG) is an 8,072 mile journey, requiring a 15+ hour flight. A paid first-class ticket can run well north of $30,000 (that’s not a typo), but with Avios its 210,000 points (I dont know why it is in band 7, but ultimately the BA.com website has final pricing authority), and about $300 in taxes round trip. You can then sleep well for those 15 hours, enjoying $500+ bottles of champagne, and double that amount in caviar. Obviously, 210,000 Avios is quite a princely sum, but if you get several credit card signup bonuses, and plan it out properly, it is attainable. Iberia – Madrid based, use as an alternative to get to/around Europe avoiding the taxes of flying on BA. AirBerlin – Berlin based, use as an alternative to get to/around Europe avoiding the taxes of flying on BA. So if you know anything about the airlines listed above, you’ll realize there are not many places in the world that can’t be reached by Avios. The Avios calculator should help you get started with approximate pricing for the flight you’re interested in booking. To book award flights, you’ll need to start your research on British Airways website www.ba.com; create an executive club account and you’re off. Use the search tool to check out availability and prices. Just a word of warning, not all OW carriers show up in the search results, so you may have to call to to have the agent check for you about award availability. If you decide to book over the phone, it comes with a $25 booking fee that can be argued out of, if the flight is truly not bookable online. We hope this is enough for you to get started planning your trip. Traveling doesn’t have to be expensive, it is a matter of understanding the point system and making the most of it. ‘Like’ us on Facebook or ‘Follow’ us on here to get more travel tips in the future.